WI-FI is now available on more than half of all South West Train services, helping to keep tens of thousands of passengers connected during their journey. 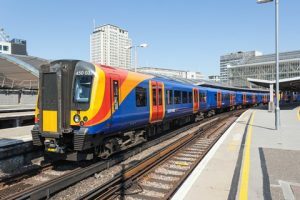 Woking is one of five busy SWT stations where Wi-Fi has been rolled out, with more than 30,000 travellers already signed up to use the Sky Cloud service. It is a joint investment, with funding provided by the Enterprise M3 LEP and contributions from Surrey and Hampshire County Councils. The project follows a successful bid to the Department for Transport as part of the Local Sustainable Transport Fund and is also operating at Aldershot, Basingstoke, Farnborough and Guildford stations, concourses, platforms, waiting and other public areas. More than £50 million is being invested by SWT.